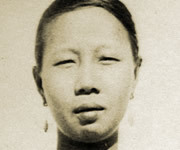 Born of Chinese parents, Lily became a housemaid for a European family after leaving Darwin Public School at 14. Then she met Jimmy, a hawker with his own market garden and truck. Lily and Jimmy married and moved to Pine Creek to set up a general store. Apart from supplying the Pine Creek population with provisions, Lily bore five children and raised another five adopted children. She was interviewed for Film Australia's Australian Biography series in 1995.